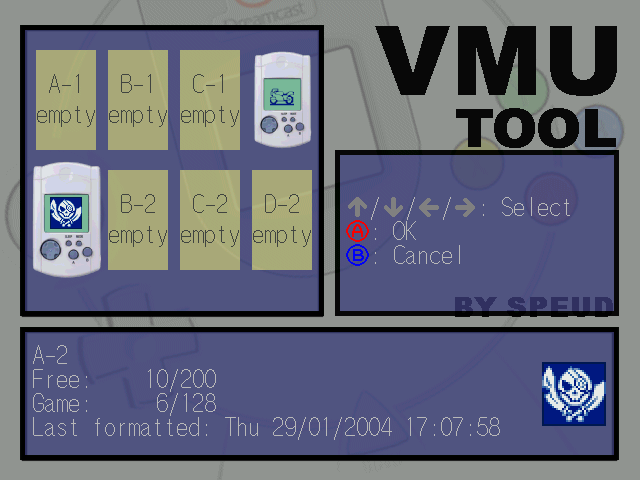 Dream Explorer (a.k.a VMU Tool) is a mini OS for the Dreamcast that allows you to explore the content of your VMU, PC, and CD/GD, and open their files in the numerous bundled tools. 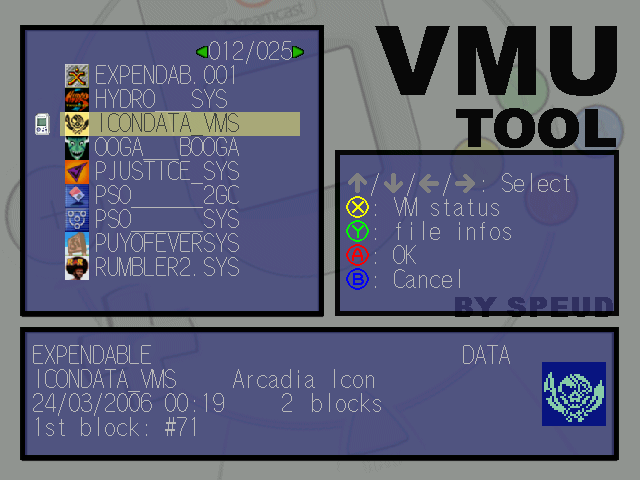 Among other things you can easily backup up VMU files to PC and vice versa, or download VMU files from CD. DCI and VMI+VMS files are supported as well as raw or DCM dumps. 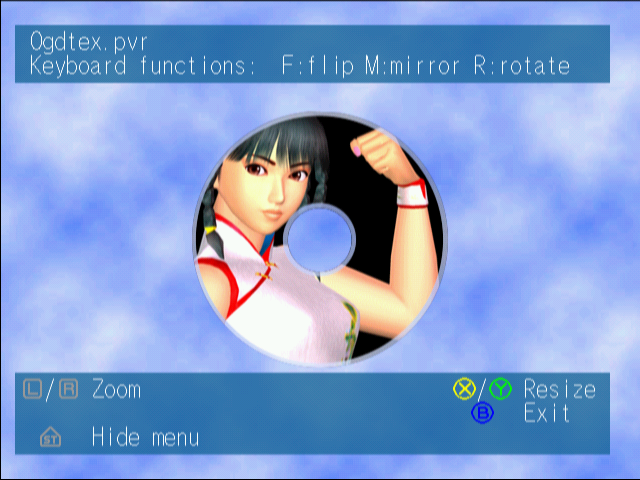 The PC/CD explorer lets your freely browse the directories of your PC's hard drive disk or the CD/GD inserted in your Dreamcast. 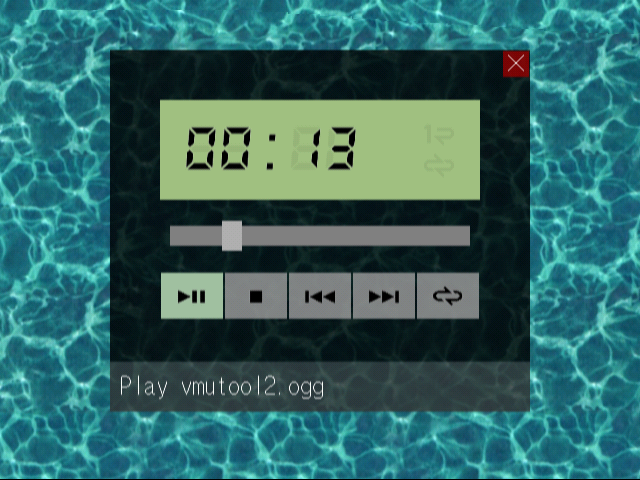 There's also an audio player for playing MP3, Ogg Vorbis and Wave sounds with a timer displayed in real time. 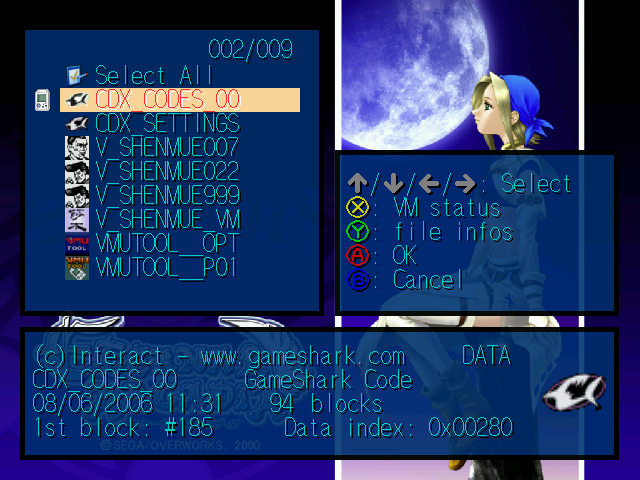 And if you want to read text files easily from your Dreamcast you can open them in the text viewer. It displays formatted text with auto carriage return. The GUI is fully themable. 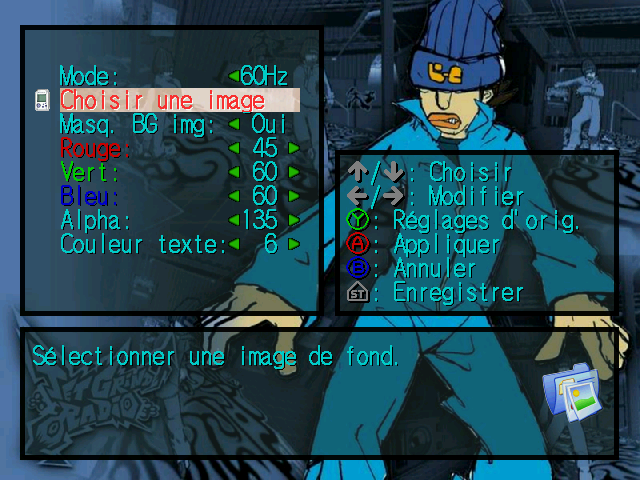 You can select a wallpaper from your PC or a CD/GD in your Dreamcast. 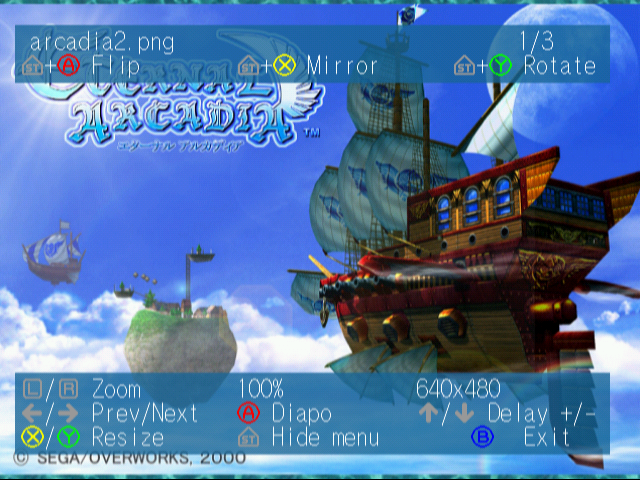 The menus' background color and opacity as well as text's color can be changed in options or loaded from a theme file. Menus texts are translated to English (fully) and French (mostly), and also partly to German, Dutch, Portuguese, Spanish, Swedish and Polish. 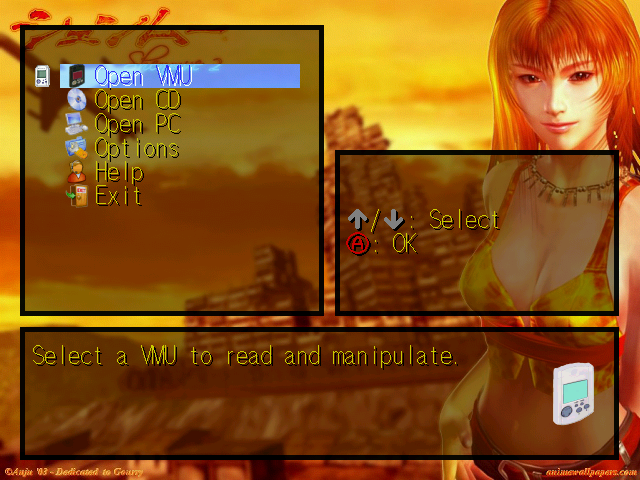 You can use the pad or the Dreamcast keyboard to browse menus and enter text, keyboard's keys position can be changed in options. Donations motivate me a lot and are greatly appreciated. If you want to help follow instructions described on this page. 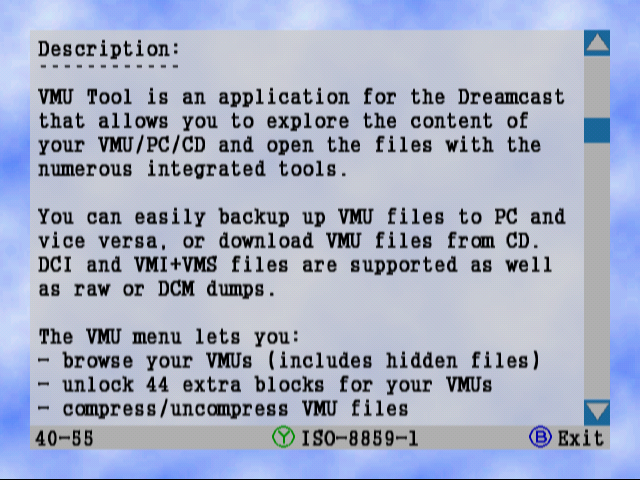 Upload your files to share them with everybody and free your VMU safely: VMU uploader for DC & PC. Please report bugs to speud@free.fr (try to explain them as clearly as possible, in english or french). Thanks to TheGatesOfBill for free hosting at www.kitsunet.org. Also thanks to everyone who offered to help. 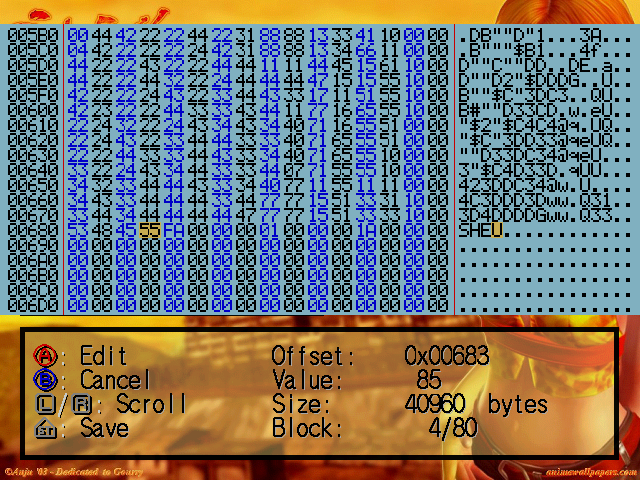 Dream Explorer for Dreamcast aka VMU Tool programmed by Speud. Some of the images were made by WaCk0. 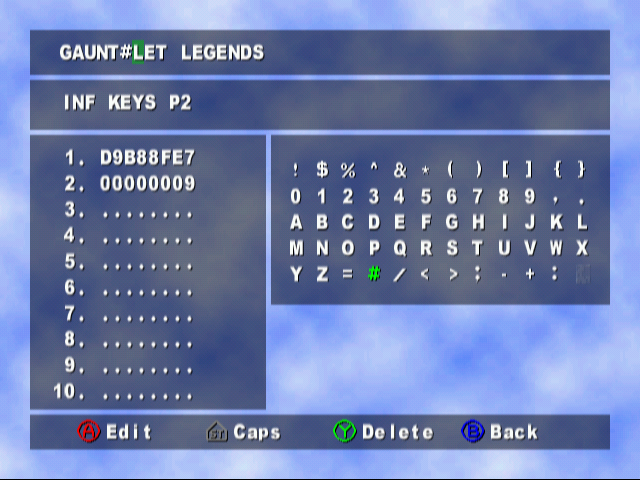 Original libraries used belong to KalistiOS http://gamedev.allusion.net/. 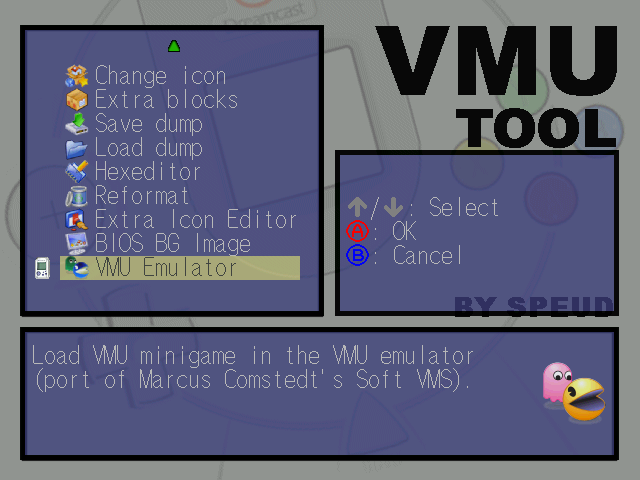 The VMU emulator SoftVMS was originally programmed by Marcus Comstedt http://mc.pp.se/dc/ (very helpful site) and ported to the Dreamcast from scratch by Speud. Menus icons iCandy Junior � 2004 FOOOD's Icons. Additional fonts found at http://www.1001freefonts.com and http://www.1001freefonts.com and converted with Celestia Font Texture Generator http://celestia.teyssier.org/ttf2txf/. Sonic Adventure™ wallpapers © SEGA ETERPRISES, LTD.
Sega, Dreamcast, the Dreamcast logo and Visual Memory are either registered or trademarks of Sega Enterprises, Ltd.
DREAM EXPLORER - VMU TOOL SOFTWARE IS NOT PRODUCED BY OR UNDER LICENSE FROM SEGA ENTERPRISES, LTD.